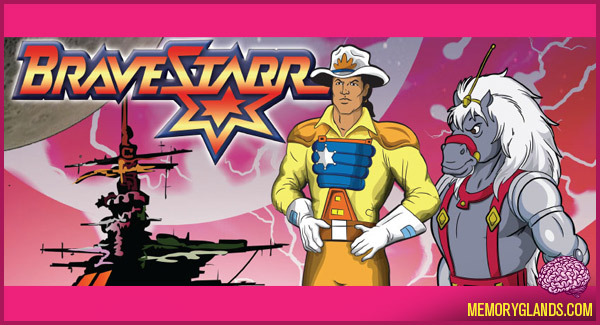 BraveStarr is an American space Western animated television series. The original episodes aired from September 1987 to February 1988 in syndication. It was created simultaneously with a collection of action figures. BraveStarr was the last animated series produced by Filmation and Group W Productions that was broadcast. “Bravo!”, a spin-off series (originally called “Quest of the Prairie People”) was in production along with “Bugzburg” when the studio closed down. Reruns of the show currently air on Qubo Night Owl, and on the Retro Television Network. The idea for BraveStarr began with Tex Hex, his chief adversary. Tex Hex was created by Filmation’s staff artists in 1984, during the development of Filmation’s Ghostbusters. Lou Scheimer found the character fascinating and pulled Tex Hex from the Ghostbusters cast. He asked Arthur Nadel, Filmation’s Vice President for Creative Affairs, and art director John Grusd to develop a science fiction western around the character. As the concepts took shape, staff writer Bob Forward fleshed out the writer’s guide and eventually co-wrote the feature film script for BraveStarr: The Movie with writer Steve Hayes.